Original WW1 Magazine Detailing Events in the Great War Dated 1915 GERMAN ARMY POLAND Constantinople JUAN FERNANDEZ ISLAND HMS GLASGOW Sappers Battle Trenches DARDANELLES TURKS Lancashire Territorials Australian Engineers Egypt MOLE WARFARE Railway Engineering Battlefields SERBIA TYPHUS Neuve Chapelle Battle Scene Offensive Map SENEGAL TROOPS Belgian Dunes PERVYSE RUINS Berlin School Children. Poland - Small Force of German Soldiers with Machine Guns, But No Cover - full front page photograph. View on the Coast of Juan Fernandez Islands, Near the Scene of the Sinking of the German SMS Dresden. Inset Photograph of Captai Luce of HMS Glasgow. HMS Which Assisted in the Destruction of the Dresden. A Ship in the Bay at Robinson Crusoe's Island, Juan Fernandez. Ottoman Porters Removing Petrol Stores in the Dardanelles. A Turk Captured in Suez Fighting. Typical Turks Discuss Events on the Steps of a Constantinople Mosque. An Ottoman Sentry on Duty on a Turkish Troopship from Anatolia to Stamboul. Section of Engineers of the British Army Under Fire While Digging a Trench Only Twenty Five Yards from a German Trench - full page drawn by Dudley Tennant. Members of the Lancashire Territorials On a Route March after Training In Egypt. A Military Suspension Bridge Construction near the Pyramids by the 3rd Field Company of Australian Engineers. Camels Returning to the Front near the Canal. Group of The Territorial Engineers section and a Pontoon Boat They Have Built. 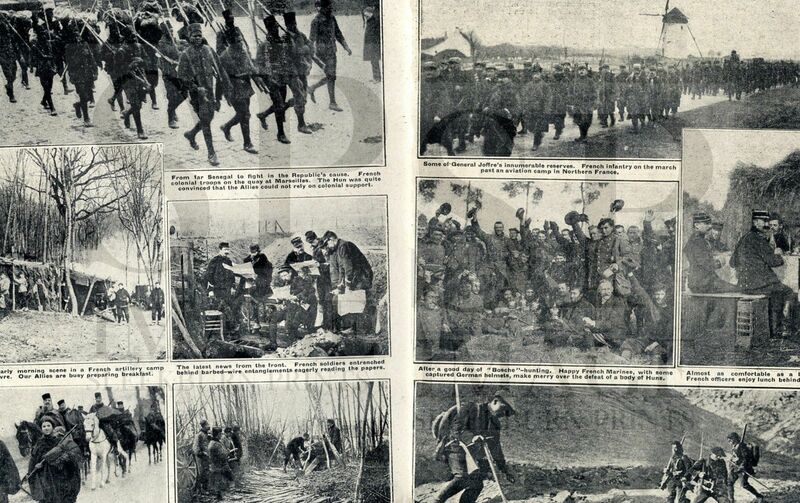 Territorial Red Cross Marching Out of Cairo. Australian Engineers Constructing a Pontoon Bridge Over an Irrigation Canal near the Pyramids. Imposing Funeral Ceremony of an Arab Sheik in the Streets of Cairo, Blind Men Lading the Procession. Queensland Transport Service Men With Reive Stores Leaving Cairo for their Encampment. Forest Furrowed with Trenches and Dug Outs - Huns in Strange Shell Proof Dug-outs. French Dug Outs near Lille Constructed Alongside an Avenue of Trees.c.keenlyside. Entrance to an Underground Refuge for Wounded French Soldiers in the Argonne. Interior of an Underground Bomb Proof Hospital of the French. French Officer's Retreat in the Argonne - showing a hut/tent camouflaged in the trees. French Trenches Built One Above the Otherin the Argonne District. German Soldiers Reading Letters from Home and Drinking Wine from a Hamper. British Soldiers Crouching in a Trench While a Black Maria Whistles Overhead. In the Argonne - A View of A French First Line Trench With Bomb Proof Shelters. French Sappers Repairing Damaged Railway in Northern France. A Hastily Erected Railway Bridge Built By French Engineers. French Sappers Constructing a Railway Embankment <p< New Railway Trasck Being Laid Down in Northern French. Serbian Women Wait Outside a Hospital For News of Their Menfolk. Serbian Artillerymen Travelling to The Front - Sir Thomas Lipton with the Brtish Red Cross Unit Seen in the Corner of the Photograph. Prince Alexander of Serbia Talking to Austrian Prisoners in Nish. Serbian Gun Damaged by Austrian Fire in Belgrade. A Typhus Victim Being Stretchered Away. The Battle for Neuve Chapelle - British Infantry Charging a Trench - double page drawing. French Colonial Troops from Bengal on theQuayydea maareils. French Artillery Camp of the Woeve Preparing Breakfast. French Soldiers in Trenches Behind Barbed Wire Entanglements Reading the Papers. Road of Treetrunks Constructed Over Treacherous Mud for the Transport of a "75" Gun. General Joffre's Reserve Infantry On the March Past an Aviation Camp in Northern France. Happy French Marines With Captured German Helmets. French Officers Enjoy Lunch Behind the Firing Line. In the Vosges - Some Alpine Chasseurs Negotiating Mountain Torrents. Germans Returning From a Foraging Expedition in a Belgian Village Carrying Purloined Fowls: Loaves of Bread and Milk. Officers of a Scottish Regiment After Hunting Rabbits. Beef for the Huns Keenlyside. Young Woman Serving Wine, Bread and Cheese to French Officers. Belgian Artillery in Action in Flanders. Belgian Gunners Wheeling Their Guns With Difficulty into Position on the Dunes. Watching for A Glint of Spiked helmets from a Sand Ridge. Belgian Motor Cyclist Scout on the Look Out. Artillery on the Sand Dunes, A Gunner Sighting the Gun. Funeral of a French Soldiers Horse - - Interring the Carcase of a Horse Killed Miel by an Explosion. Belgian Soldiers near Oostkerke in the Ruins of a Building. A French Red Cross Nurse in Uniform. sleekburnc. Indian Soldiers ON the March in France. All that Was Left of the Church of Pervyse After "Kultur" had Finished With It - info. Pervyse. King George V with Earl Kitchener Inspecting Canadian Infantry on Salisbury Plain. Canadian Cavalry Cheering the King AFter Reviewing Troops on Salisbury Plain. Dummy Guns - Tree Trunks Covered with Straw to Fool Enemy Aviators. A British Gun Concealed By Brushwood and Small Tres. Men Sitting Next to a Conceadled British Gun. Dummy Guns Which Fooled the Germans During the Yser Fight. L'Entente Cordiale Humour - French and British Soldiers Telling a Joke. Berlin School Children Bring Door Handles, Baths, Saucepans Etc to Be Melted Down. Government Official Taking Stock o the Output of A Berlin Bakery. Wounded German Soldiers on the Spree With Their Female Helpers. Troops Off to the Front From Friedrichstrasse Station. Article on Naval Warfare by Commander Carlyon Bellairs. Article on Air Warfare by C. G. Grey. Article by the Daily Mail War Correspondent F. A. McKenzie. Article by Carlyon Bellairs RN on the war at sea, the Navy etc. An article on Air Warfare, RFC (RAF) etc by C. G .Grey. Article on the events etc in the war by F. A. McKenzie a Daily Mail War Correspondent. A very descriptive publication, printed on a light quality paper priced 6d. A cheaper option to some of the more popular illustrated magazines of the day, such as Illustrated London News etc. but more down to earth and detailed. Although it contains articles, the main focus is on photographs, drawings, maps etc. It measures 285mmx220mm (11.25 x 8.5") approx. Spine is loose with binding witness marks. There is age yellowing/toning and some marking. Some creases etc to corners and handling marks to edges. Images, photos sketches etc. vary in size. PLEASE NOTE: I cannot guarantee that the issue is complete 'as published' - but what I have described above IS present. The outer cover is missing; but as far as I can tell there are no other pages missing. If you're looking for something in particular in this issue PLEASE ASK. If you require information on size of articles (i.e. number of words), sizes of images, please ask before bidding or buying. This item will be packaged in a board backed envelope. The descriptive text in my listing, details the content in my words and not necessarily what is written on the original page. "Info." in the description is my research, although relevant to the accompanying image or article, is not necessarily in the text. All text descriptions etc. in our listings are protected through copyright law, and have been electronically and invisibly coded. Reproduction, in whole or part, without permission is a transgression of copyright. It measures 285mmx220mm (11.25 x 8.5") approx. The outer spine has been reinforced/repaird at some time. The inside pages have binding witness marks. There is age yellowing/toning. Some creases, wear/handling marks and few little nicks to edges etc. Images, photos sketches etc. vary in size.